Cute doesn’t even do this photo justice. TLB was stylin’ even at a young age. Check out that Ruff Wear collar and Red Dingo tag. I won’t mention the obvious. 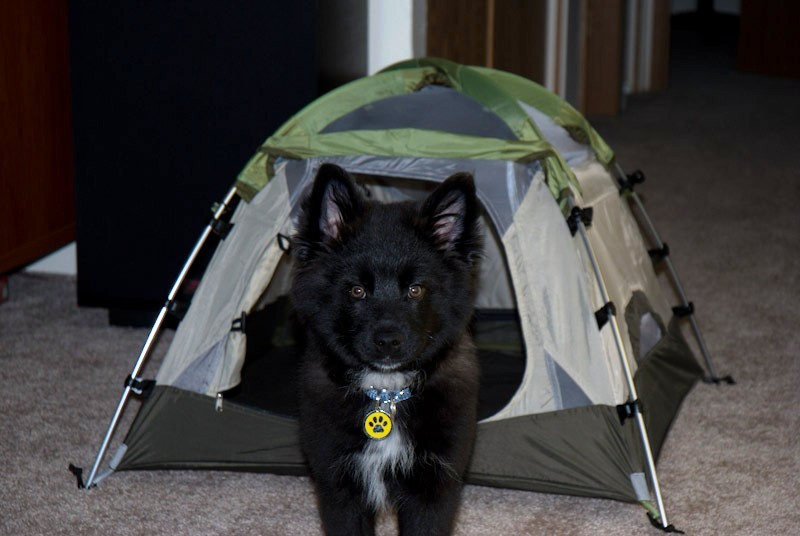 Puppy tent! I was MIA on Tuesday because I had a gnarly headache and went to bed at 8:30 PM. Granny! So, sorry ’bout that. I’m back with an Essentials review! I picked this safety light up about a year and a half ago at a local pet store. Teton is completely black so it’s almost impossible to see him when we’re outside in the dark. This is especially (potentially) dangerous during evening and/or early morning walks or when we’re camping or hiking and he is off-leash. There are lots of pet safety lights on the market. Not sure why I chose this one…maybe I was stupefied by the alternating, flashing colors? This little contraption was $9.99! I WAS ROBBED. Keep in mind that this purchase was made: 1) in a rush (we had a camping trip that weekend and I didn’t have time to order a safety light online) and 2) when I was a new Dog Mom and didn’t blink an eye at ridiculous purchases/prices on pet items because, well, they were for my little dude. Yes, ladies and gents, Google Shop for this very item and you will see it for not $9.99, not $7.99, but $4.00. The Flipo Pet Blinker is fairly easy to use. It comes with a replacement battery but since we use it only on evening/early morning walks or when we’re camping, I haven’t had to bust it out yet. To turn the Pet Blinker on, simply press the black, squishy dot on the side. I like that the Pet Blinker has a clip that makes it easy to remove and attach. And I think that the alternating blue and white colors are great. We call TLB’s Pet Blinker his rave light. Once he’s old enough to stay out past nine he’s planning on hitting up some sweet raves. I always feel a little more at ease when TLB wears his rave light on early morning and evening walks. It’s definitely a must-pack-item on camping trips, too. Honestly, though…I’m looking into upgrading to a bigger, brighter safety light. TLB just has too much fur for this little Pet Blinker to be effective. So, on to the rating! 1. Price – $9.99 is way too high for this item. It’s tiny and the quality is not worthy of that kind of price tag. 2. Quality – It feels a little on the cheap side (sorry, Flipo!). Sometimes the on/off button sticks and other times you have to push it just right for the light to come on. 3. Benefits – Obviously, the benefits of this item are huge. Safety is so, so important (especially when you have a dog that is difficult to see in the dark!). 4. Ingredients/Features – I think that the Pet Blinker’s main feature is that it blinks in alternating colors. This is awesome in my opinion because it draws more attention to the area surrounding your pet. 5. T-Factor – The Pet Blinker doesn’t bother TLB. That, to me, is a win. A lot of pet safety items are big and bulky or uncomfortable and this item is none of those. 6. Uniqueness/Fun – If you thrive on compliments surrounding your pet and enjoy discussing pet products with other dog owners (oh, not everyone likes talking about the latest trends in pet products? ), this is a good product for you! This safety light is different from others on the market because it blinks in two different colors. I’ve been stopped a few times and asked about it or been complimented on my using it for TLB. Taking all elements into account, TLB and I give Flipo’s Pet Blinker a score of five out of 10. Shocked? I am, too. But price and quality aren’t everything, people. 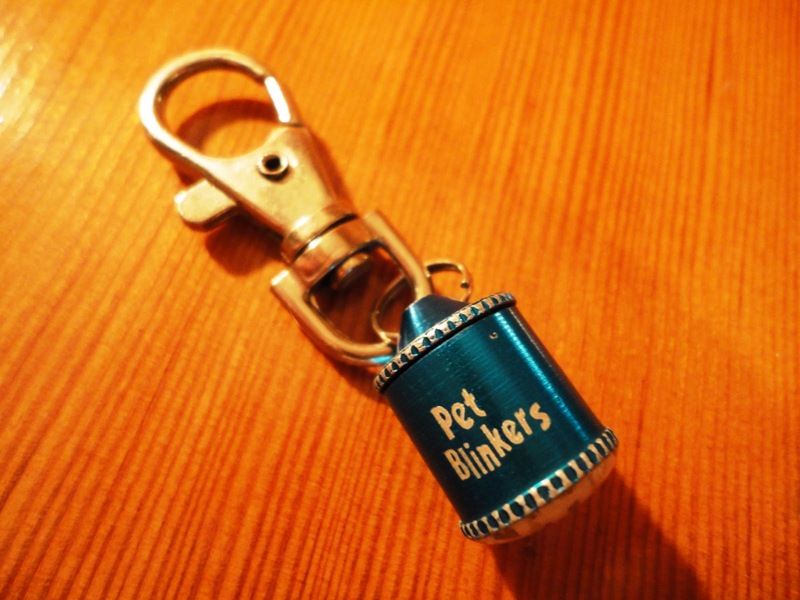 In this situation, the benefits of the Pet Blinker outweigh the hefty price tag. And, the reality is that if you are interested in this particular type of safety light, you can find it for much cheaper online. Like I said, I’m in the market for a new safety light for Teton. My criteria? Under $15, blinks in either alternating colors or a bright white, can be easily removed/attached to his leash, collar, or harness, and is not bulky, heavy, or cumbersome. Any suggestions, pet product junkies? Posted on January 20, 2011 May 14, 2011 by Shannon	This entry was posted in This 'N' That. Bookmark the permalink.